The Grand Journey has a fitting name for the kind of adventure that awaits you once the game has finished loading. The game’s theme is about an adventurer that finds a land that was long forgotten. By the looks of it, they use a drilling machine to reach this isolated land where dinosaurs still exist and where there are some tribes of humans as well. 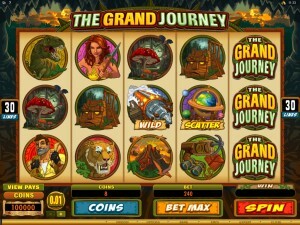 Microgaming created a beautiful slot machine in The Grand Journey, and I enjoyed every minute of it. 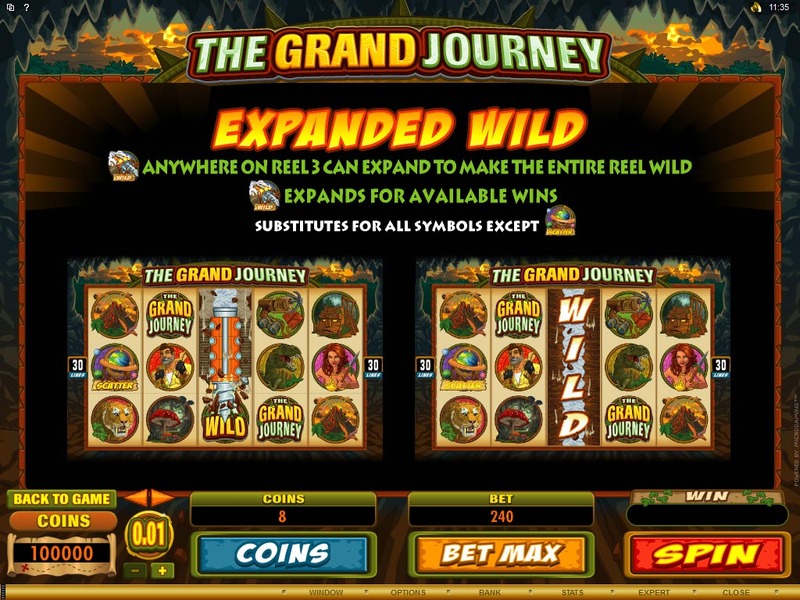 The Grand Journey has all kinds of cool features, including stacked wilds, expanding wilds, free games, up to 10x multipliers and a scatter symbol. 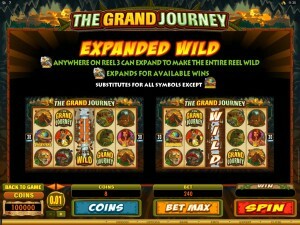 The game has 5 reels and 30 lines, with top payouts of $12,000. The design isn’t the only one that is special here. 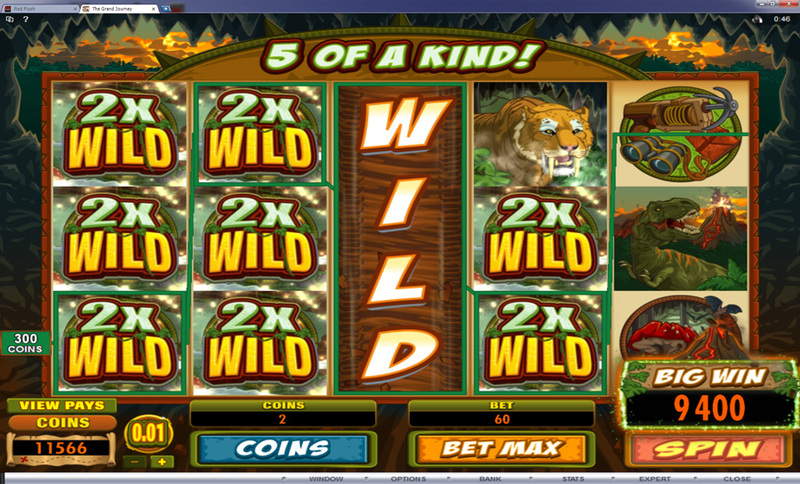 As you play you will encounter both stacked and expanding wilds, scatter symbols, free games and big multipliers. One of the symbols which is very important in this game has the logo of The Grand Journey on it. This is a stacked wild, appearing on all the reels and being capable of substituting for other symbols and also doubling their prizes when they had a contribution. The same stacked wild is responsible for the formation of the top paying combination, which means that you also get a chance to form more than one wild combo in the same round. The scatter symbol can’t be replaced with a wild. A second wild can appear in the game, one that has the ability to expand and cover the entire reel if that will get you a new win. It’s only used on the 3rd reel though, so it’s not as useful as the stacked one. When it appears, the wild takes the form of a drilling machine which goes through the entire reel forming a tunnel. The word WILD will appear in the resulting space. The third symbol with extra powers would be the scatter, with the Globe image being chosen for it. 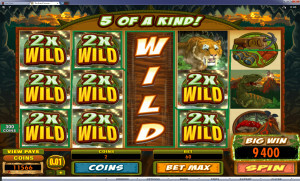 It is used like in many other slots, offering prizes for 2+ symbols and free spins for 3 or more. The prizes are worth between 1x the bet and 100x the bet. When 3+ Globes are present anywhere on the reels, you will get 15 free spins and an interesting multiplier feature, of up to 10x. Unfortunately, you can’t retrigger these free spins. 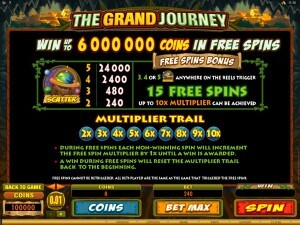 The Multiplier Trail goes up by 1x each time you get a spin without a win in it. It can reach 10x if you have 10 consecutive rounds without wins in them. Once you have a spin with a prize, the multiplier resets to 1x. Though you can change the coin’s value, the range is only from $0.01 to $0.02, so there are only two steps to that option. However, you can use up to 20 coins on each line, so that’s how you get to modify the line bet if you need to. A line bet reaches a value of $0.40, with the total for the game being $12 with all 30 lines active. The game rewards you handsomely, putting up to 20,000 times the line bet in your pocket. In this case, that means up to 400,000 coins, but only $8,000. 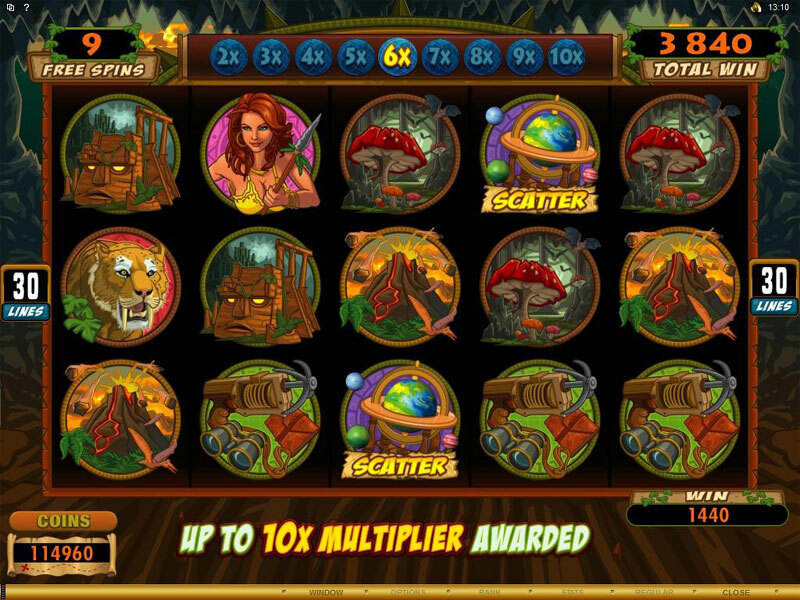 If the scatter is the one that lands five symbols, it pays 100x the bet, so up to $12,000. 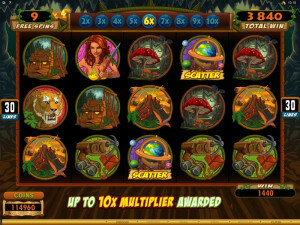 These don’t take into account the multipliers possible during free spins, of up to 10x. One of the things you will enjoy most about The Grand Journey is the design. Featuring adventurers, beautiful women, dinosaurs and all sorts of things from those long lost lands, the game looks like a lot of fun. The background shows you these new territories which our adventurer explores. Symbols: Game Logo (20,000x, stacked wild), Drill (expanding wild), Globe (scatter, 100x the bet), Adventurer (10,000x), Amazon Woman (6,000x), Dinosaur (3,000x), Saber Tooth (2,000x), Volcano (1,000x), Wooden Construction (900x), Toadstool (800x) and Weapons (700x). 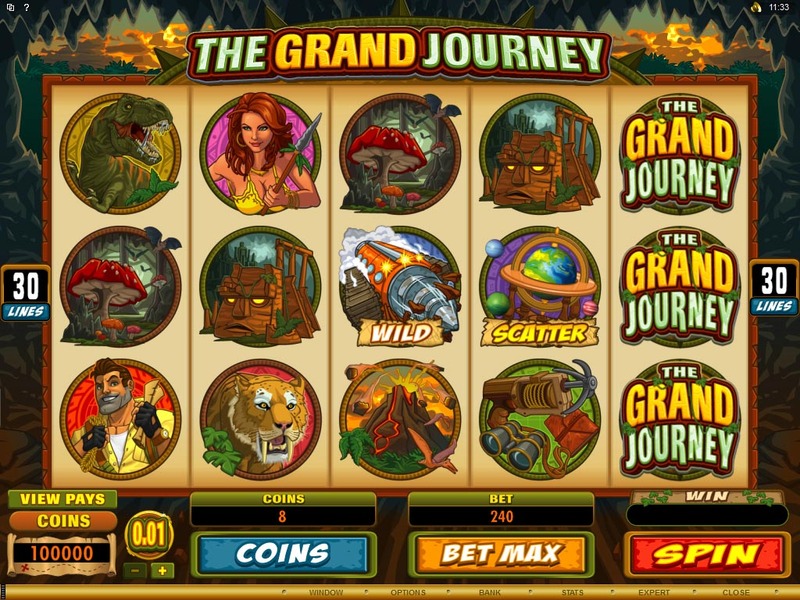 The Grand Journey takes you on a grand adventure, in a long lost land which was beautifully designed by the developers from Microgaming. I think you will enjoy it, I certainly did. 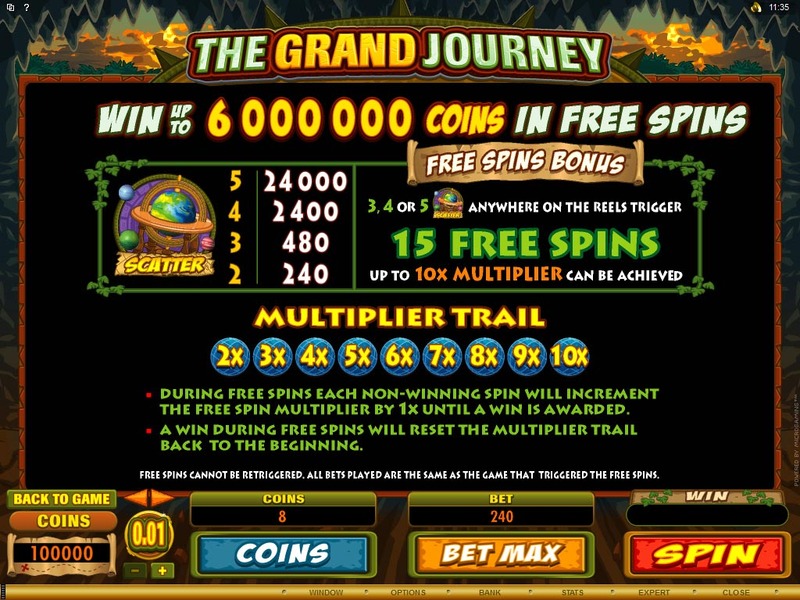 The The Grand Journey slot machine is offered through the Microgaming platform, so if you want to play it for real or just to practice, look out for casinos that use it.